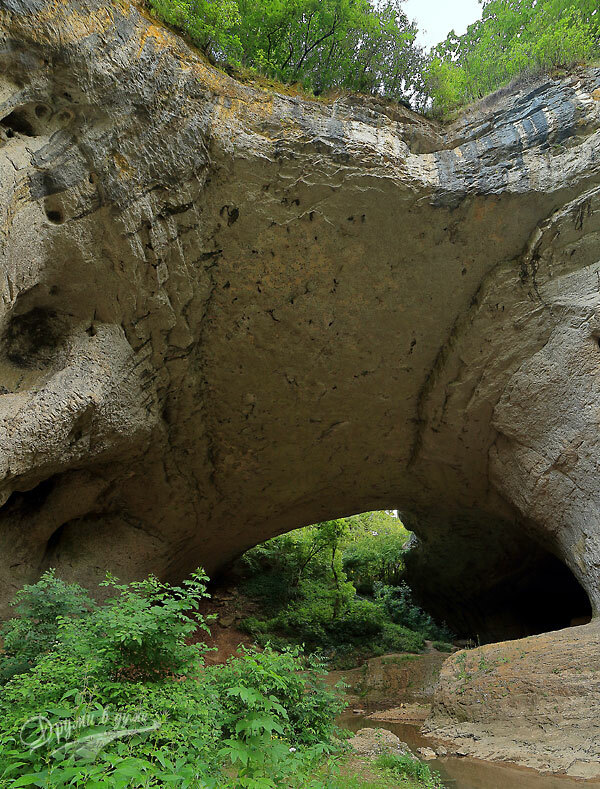 The God’s Bridge is an interesting rock phenomenon near the city of Vratsa. It is a passage cave similar to the Wonderful Bridges in the Rhodope Mountains. The God’s Bridge is located between the villages of Lilyache and Chiren, about 15 km north of the city of Vratsa. We visited this so interesting place in the mid-June. 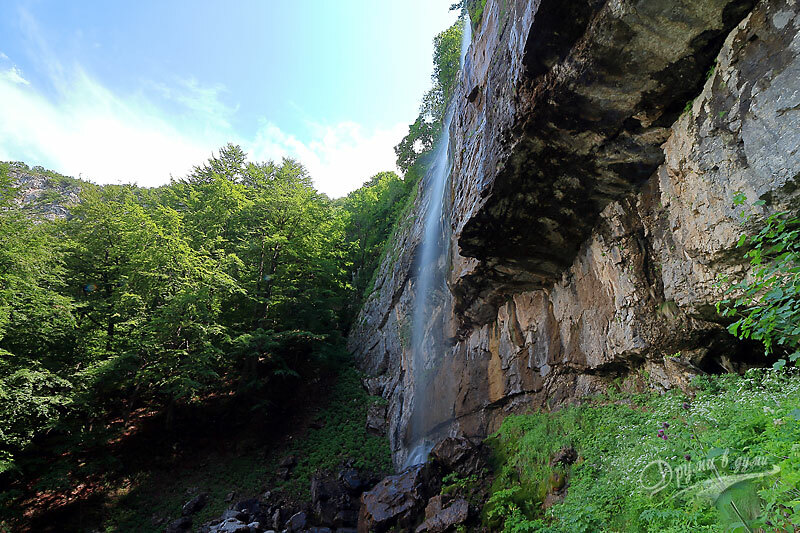 The Borov Kamak (means Pine stone) Waterfall is one of the highest waterfalls in Bulgaria. The waterfall is so beautiful. It can be reached by an attractive eco-path. Borov Kamak Waterfall is fed by the Leva River – the same, which forms the scenic gorge near the town of Vratsa – Vratsata. The footpath to the Borov Kamak Waterfall starts near the village of Zgorigrad which is about 5 kilometers far from Vratsa. Beside the big waterfall Borov Kamak, along the eco-trail to it, you can see many smaller waterfalls, all of them so beautiful. The Borov Kamak Waterfall was part of our June excursion in the region of Vratsa. I really like the beautiful places of Northwest Bulgaria, because the most of them are not very popular. An interesting place we discovered this year was the cave Venetsa near the village of Oreshets – a very beautiful cave that was opened for tourists two years ago. We visited the Venetsa cave in late September. The Ancient Ceramic Center near the town of Pavlikeni, Veliko Tarnovo region, occupies an impressive area of about 9900 square meters. It consists of a Roman villa and over 50 well studied furnaces for building, artistic and domestic ceramics, most of which are protected from the raids of time under a glass lid. The antique ceramic center, and in particular the Roman villa, date back to the 1-3 century. The villa is of Villa Rustica type, ie. suburban villa. The place is located about 5 km northwest of the town of Pavlikeni on the way to the village of Varbovka. We visited the place in February. The Hotalich fortress near the town of Sevlievo is a remarkable place, which impressed me with its size, incredible views to the high parts of the Balkan Mountains and its settlement. The Hotalich fortress is among the best studied and maintained medieval towns in Bulgaria. If you travel from Sofia to Veliko Turnovo or plan to visit the region of Gabrovo, consider the fortress Hotalich near Sevlievo, perhaps you will like it! The fortress Hotalich is located about 184 km away from Sofia and about 4 km northwest of Sevlievo. It is very close to the main road Sofia-Varna. The fortress is on the opposite side of the town of Sevlievo with respect to this main road. We visited the Hotalich fortress in the late spring when everything was fresh and green. Glozhene monastery “St. George the Victorious” is one of the most wonderful and impressive Bulgarian monasteries. It was founded in the time of Tsar Ivan-Assen II (13 century). There was a church school in the monastery during the Turkish slavery. A lot of Bulgarian fighters for freedom found shelter in the Glozhene monastery, including Vasil Levski. After the Liberation, for about a year (1893-1894), the famous Bulgarian writer, politician and publicist Vasil Drumev, also known as Metropolitan Clement Tarnovski, was kept into custody in the monastery. The exile was because of his speech in defense of Orthodoxy while in the same time the head of the state was King Ferdinand who is a Catholic. We went to see the monastery at the end of April. The Medieval Bulgarian town of Cherven was one of the most important economic, ecclesiastical, and cultural centers during the Second Bulgarian Kingdom. 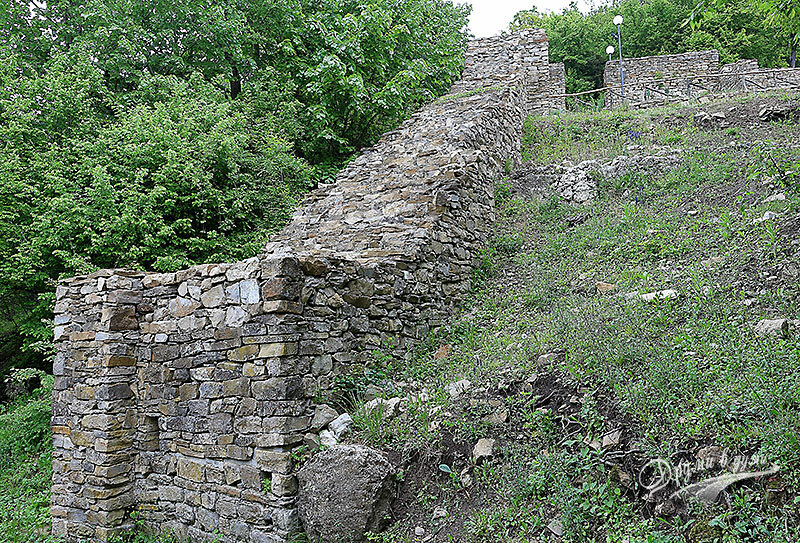 Fortress Cherven is located about 96 km northeast of Veliko Tarnovo. The fortress can be reached by car. We visited Cherven at the end of April. The Basarbovo monastery “St. 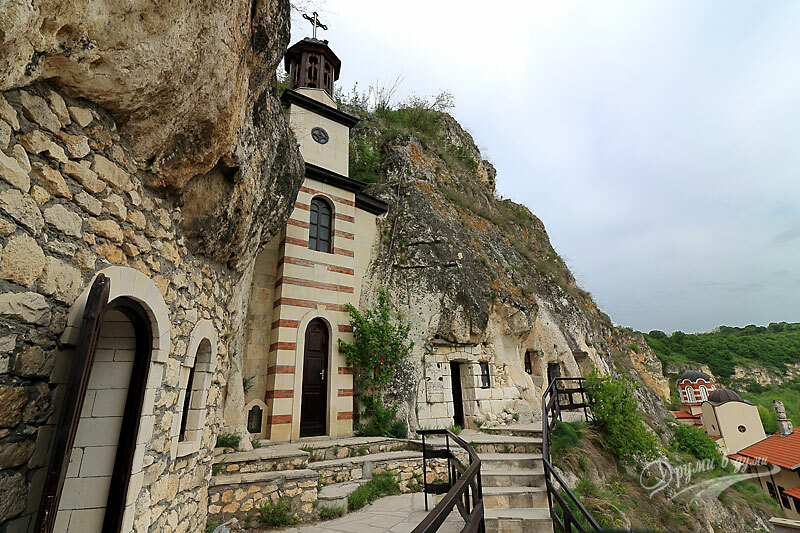 Dimitar Basarbovski” is the only active rock monastery in Bulgaria. 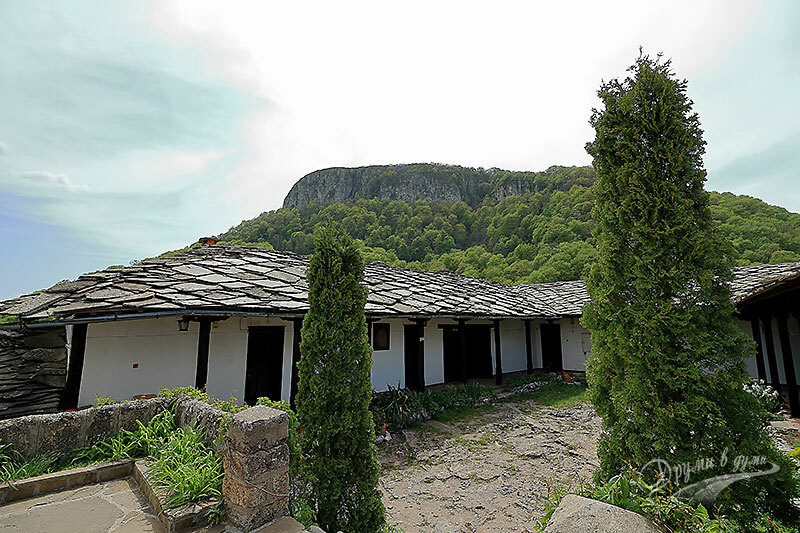 It is situated in the picturesque valley of the Rusenski Lom river near the village of Basarbovo, about 10 km south of the town of Rousse and about 104 km north of Veliko Tarnovo. It is accessible by car. 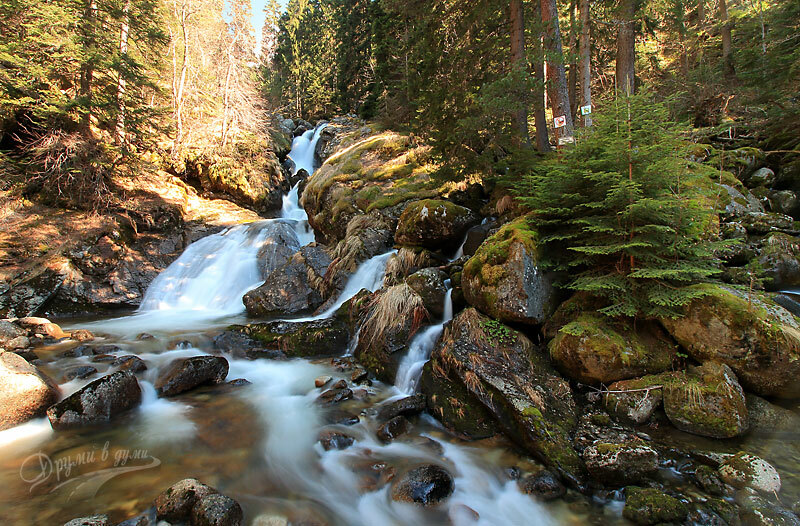 In my opinion, the Bistritsa waterfall is the most beautiful waterfall in the Rila Mountains. It “works” throughout the whole year, and the hiking to it is quite pleasant. 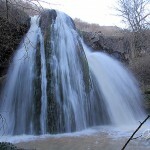 The waterfall can be reached in about 2 hours on a pleasant trail starting from the village Bistritsa near the town of Dupnitsa. The waterfall is unique and beautiful for its great height of about 35 meters and its incredible power. It has a lot of smaller falls. The waterfall is white, like a pearl, full of sparkling and playful waters, cool waters. We visited the Bistritsa waterfall in early April when the snow had not yet melted in Rila. The waterfall was very loud and powerful. One of my achievements last year was the climb of Malyovitsa peak. 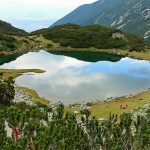 It has long been in my plans, and I did not expect to have any problems with the climb, provided that I have already climbed several high peaks in Bulgaria, including Musala and Vihren. But not! Hiking to the Malyovitsa peak happened to be quite difficult. Anyway, I’m glad I managed to get up there and go back. The incredible mountains views were worth every effort. 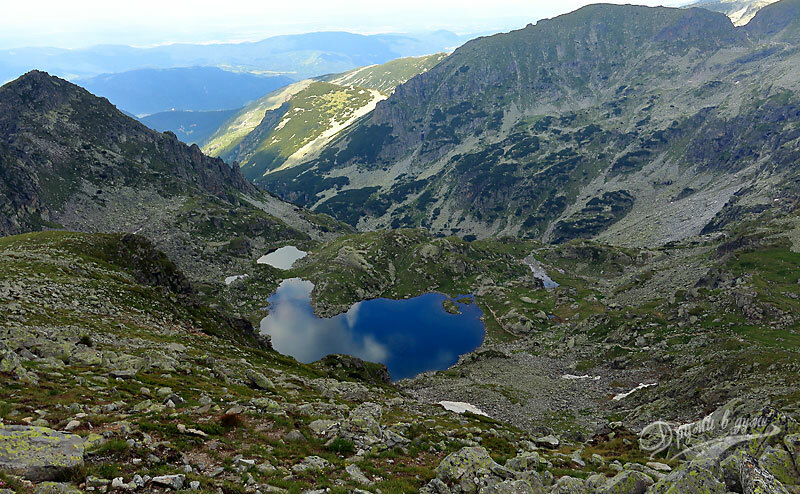 We hiked to Malyovitsa in early July. The interesting Tuida fortress is situated in the city of Sliven. It is located on the hill of Hisarlaka in the northeastern part of the town, next to the Novo Selo district. 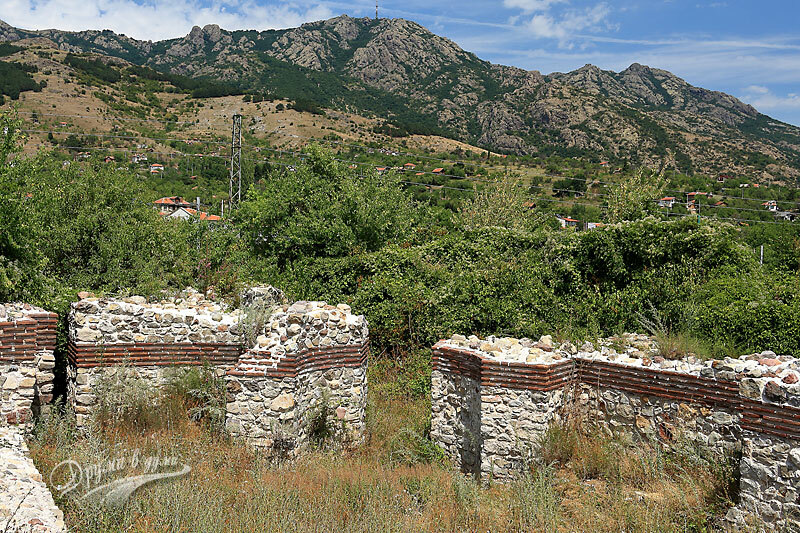 The location is attractive because on one side the fortress is on a hill and looking to the south you can see the lower districts of Sliven. On the other side, the fortress resides at the foot of the Blue Stones – it is a Natural Park, part of the Balkan Mountains, and looking to the north direction you can see the very high rocks of the Blue Stones park. 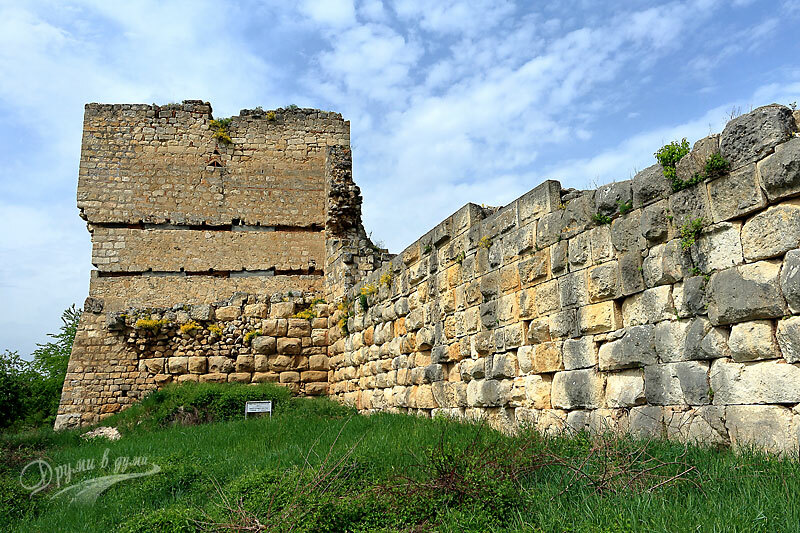 The fortress has been used for centuries – during the Roman Empire, Byzantium and Medieval Bulgaria. We visited the fortress Tuida twice this year – once, on our way to the Black sea, and the second time was in the autumn, during the Medieval Fair “Remember the Glory”. 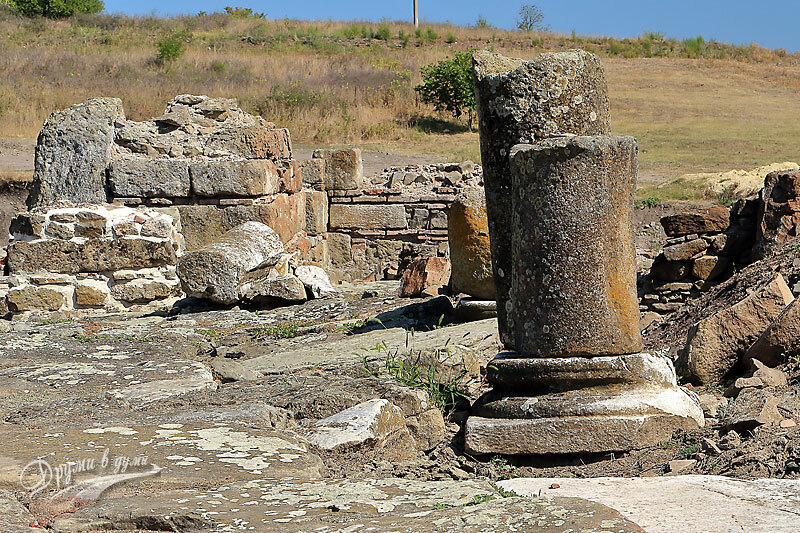 This year we visited two unique sites in the village of Karanovo – the Settlement mound and Thracian tomb with a large Thracian chariot in front of it. The tomb was dated to the middle of the 1st century. 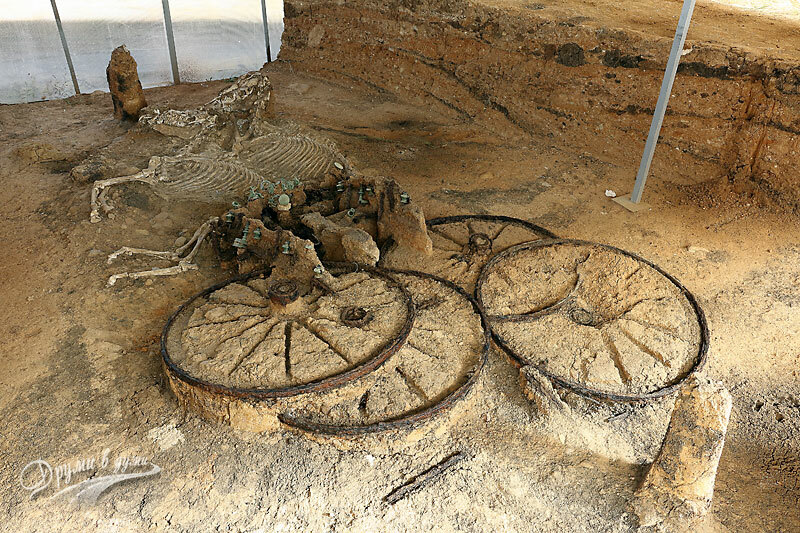 Because of the rich gifts found there and the charming chariot, it is believed that a notable Thracian aristocrat was buried there. The Settlement mound is located in the northwest suburbs of the village. The mound is one of the largest prehistoric settlements not only in Bulgaria but also in Europe. 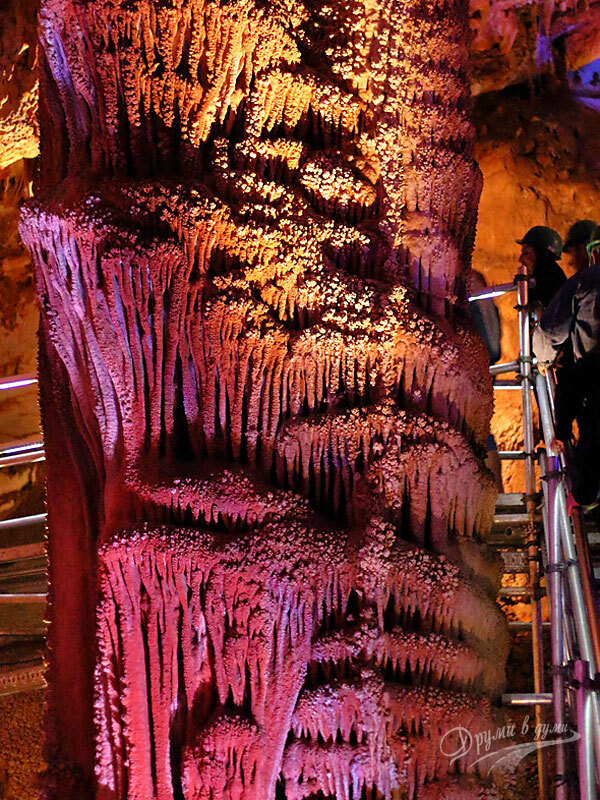 It is about 13 meters high, about 250 meters long and about 150 meters wide. It has been inhabited for more than 3 millennia – from the middle of the 6th to the 2nd millennium BC. 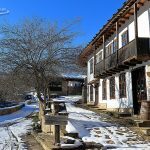 The village of Karanovo is located in the municipality of Nova Zagora, Sliven region, about 260 km east of Sofia. 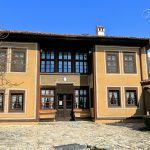 We visited Karanovo on our return to Sofia from Sliven in October. The Kazankite waterfall, I call it also the Sakar’s water jewel 🙂 , is a small but very spectacular waterfall. This beautiful natural landmark can be reached by an hour of walk along a wide trail, which starts from the road to Vishovgrad peak near Topolovgrad. We made an incredibly interesting excursion to the Sakar Mountains at the beginning of March and the waterfall Kazankite was one of the places we saw during this excursion. 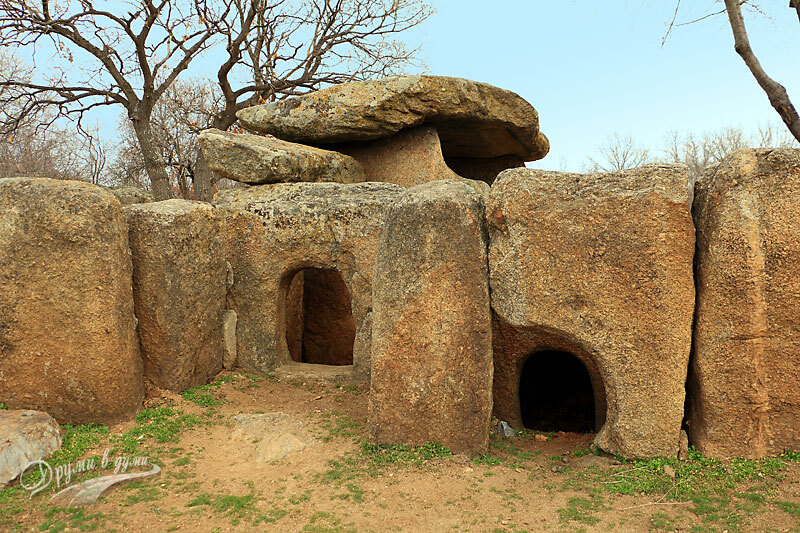 The Dolmens are megalithic facilities of the Bronze and Early Iron Age. They were made up of several vertically laid stone slabs covered with another stone slab forming a chamber. 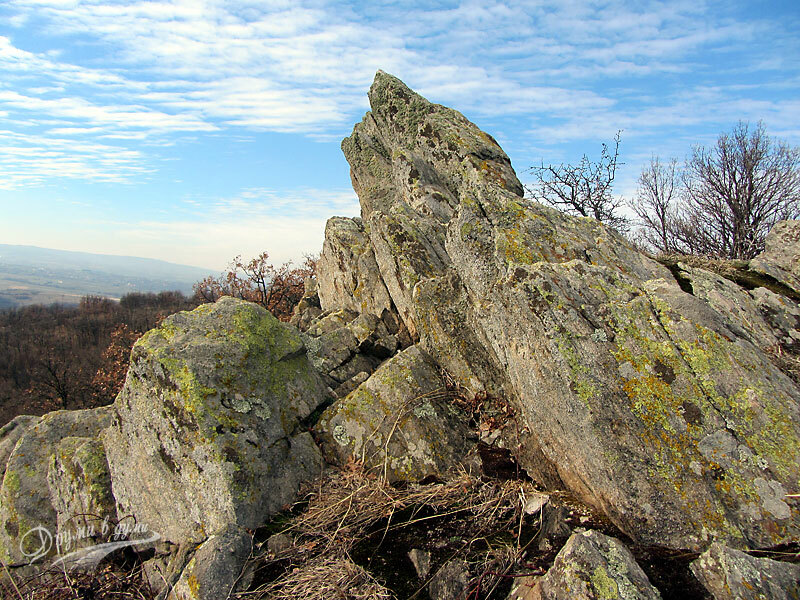 Dolmens are like a “trademark” of the Sakar Mountains in Bulgaria. The Dolmen in the Nuchevi Chairi area near the village of Hlyabovo is one of the largest, best preserved and studied dolmens. It is 2 km away from Hlyabovo on the road to the village of Bulgarska polyana. We visited the Dolmen near Hlyabovo during the aforementioned spring excursion to the Sakar Mountains. Paleokastro is a Thracian fortress and a megalithic Thracian sunny sanctuary. The site has rich history, dating thousands of years ago. At the same time, the place is wonderful for a walk. There is a eco-path leading to Paleokastro which starts near the town of Topolovgrad. Paleokastro was also part of our Sakar tour in early March. 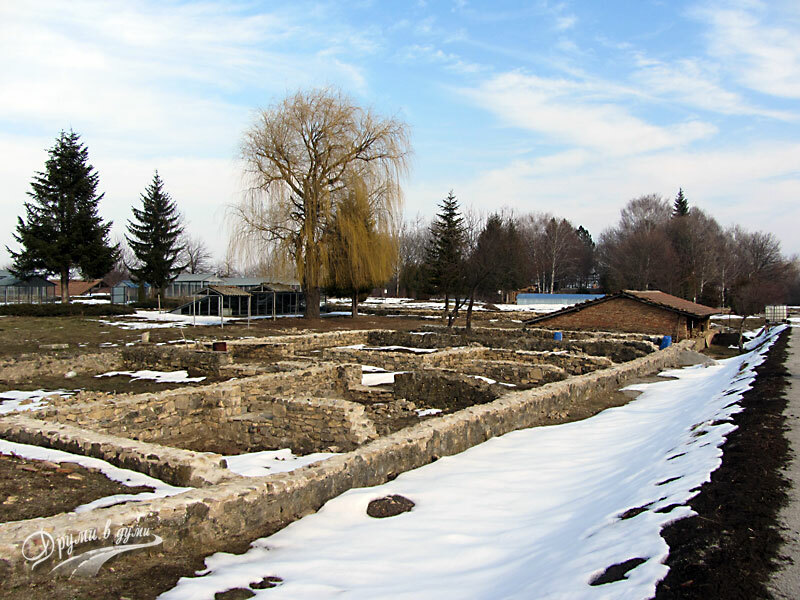 Deultum is the only colony of free Roman citizens on the current territory of Bulgaria. I visited the place last autumn and it impressed me a lot. 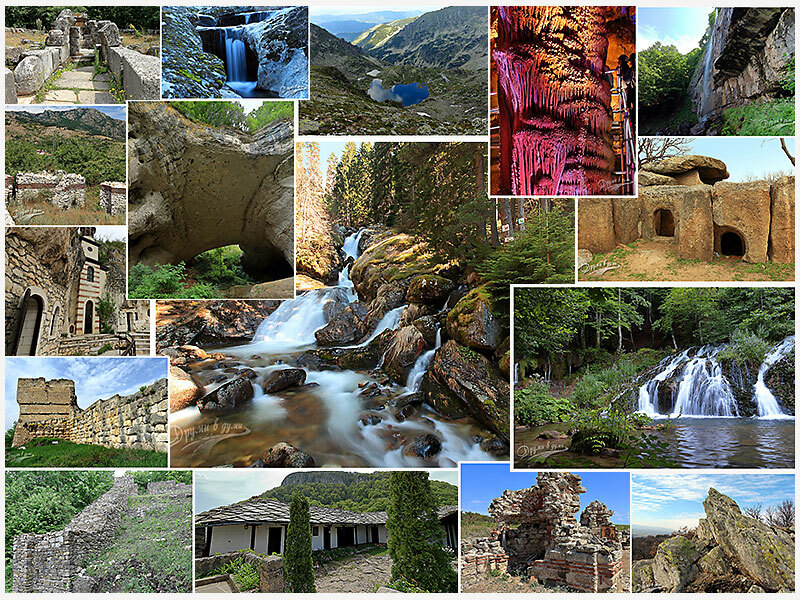 In 2011, Deultum was recognized as one of the wonders in Bulgaria. The site was initially described by the Shkorpil brothers at the end of the 19th century. At first, there was a Thracian settlement there. The Roman colony Deultum was founded by the veterans of the August VIII Legion during the second half of the 1st century under the rule of the Roman emperor Titus Flavius ​​Vespasian. Deultum is located in the eastern outskirts of the village of Debelt, Sredets municipality, about 20 km southwest of Bourgas and about 390 km east of Sofia. It is accessible by car. 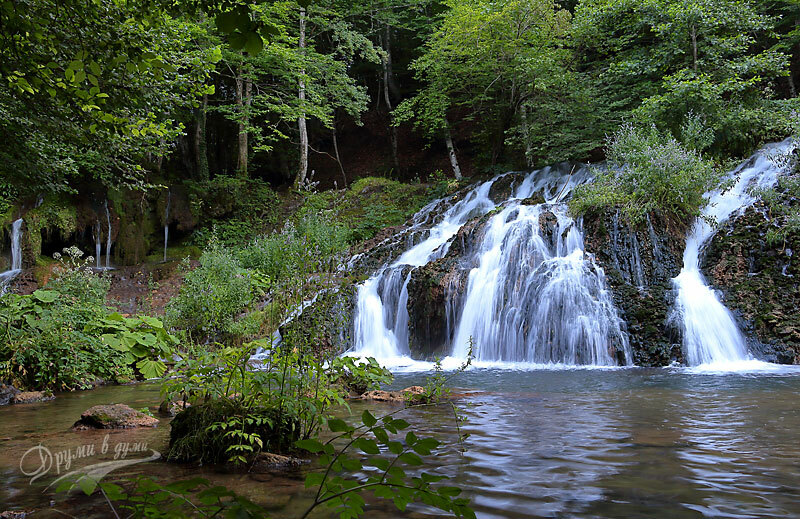 The Dokuzak waterfall is located about 7.5 km far from the town of Malko Tarnovo, just before the village of Stoilovo. The waterfall is reachable by car. It is not tall but is powerful and very beautiful, with many folds. 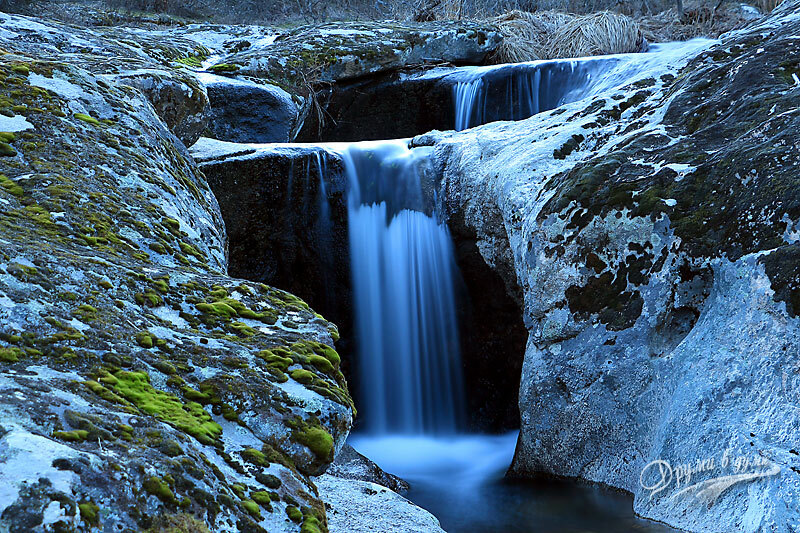 Its waters fall into many streams and are poured on edges and highly embossed rocks which makes it look as if the water flows from everywhere. Our visit to the Dokuzak waterfall was part of this year’s tour in Strandzha mountains. The Markov stone, also known as the Great Stone, is a Thracian sanctuary. It is a huge 8 meters high stone, fixed on two other rocks. On the top of the Great Stone there are two wells filled with water that is thought to be healing and helps in infertility and eye problems. Below the stone there is a so called Proviralo – a narrow slit, for which there is a belief that those who pass three times through the Proviralo will heal and their desires will be fulfilled. 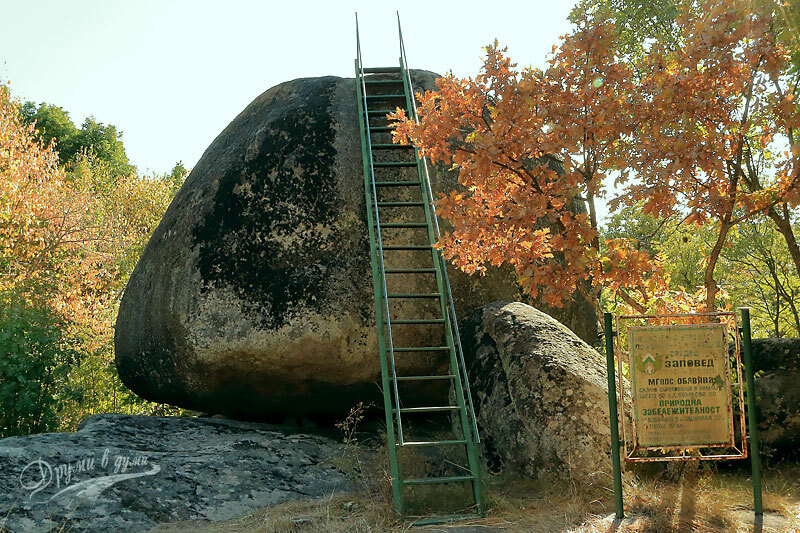 The Markov stone is located about 2 km from the village of Dolno Yabalkovo in Strandzha mountains. I visited the Great stone in September, right after Deultum. We spent a couple of days in Strandzha this summer and the region impressed us a lot. 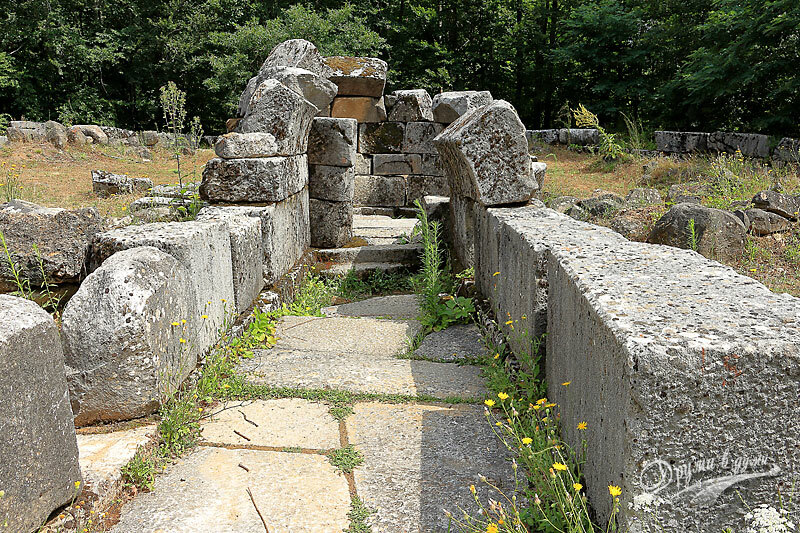 One of the most interesting places around the town of Malko Tarnovo we visited, was the Thracian sanctuary in the Mishkova Niva area. 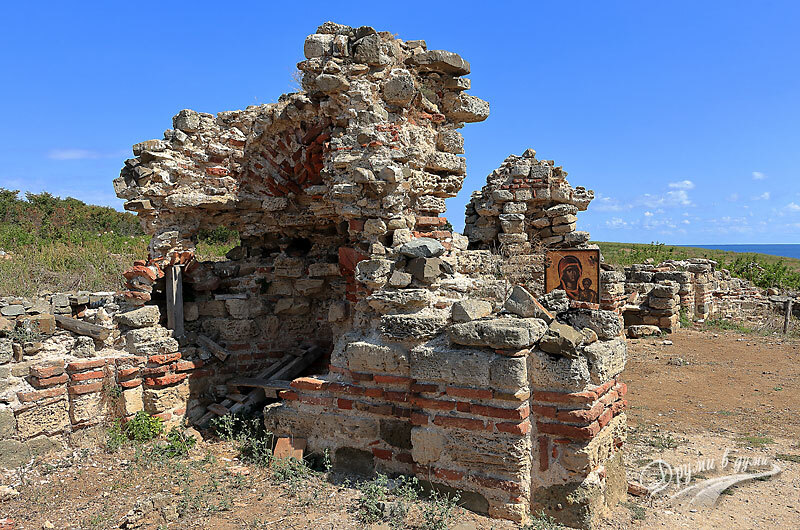 The Mishkova niva sanctuary is one of the oldest Thracian sanctuaries in Strandja region. Besides, the dome temple, which is a kind of a center of the sanctuary, has unique architecture and it is one of the most important monuments of the tomb building in Thrace. The Mishkova Niva area is located about 4 km southwest of Malko Tarnovo, behind the border fences. It can be reached by car. Keep in mind that before heading to Mishkova niva, you must go to the Border Police service and sign up there because the sanctuary is beyond the borderline. We visited the island at the end of the summer. Beside the beautiful see views you can see the ancient monastery of St. John the Baptist. A marvelous relic was found there a few years ago – a marble box with relics of the St. John the Baptist. When we visited the island, there was a team of archaeologists exploring the site and among them was prof. Kazimir Popkonstantinov, well known Bulgarian archaeologist and the main researcher, with whom we had the honor of exchanging a few words. 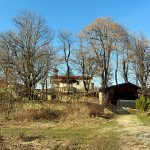 No doubt, the year 2017 was especially impressive for me because of the so many interesting places in Bulgaria we visited, a small part of which I shared in this article. It was not easy to limit myself to just 20 places, really! I recommend them all!